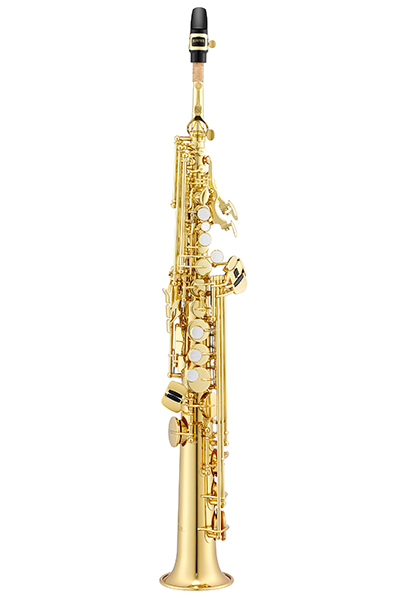 Jupiter proudly introduces the new JSS1100 Soprano Saxophone. The professional features of this performance level Soprano make it the perfect choice for the advancing student, or semi-professional saxophonist. The rich tone of the patented Sona-pure neck is further enhanced by metal tone-boosting resonators, resulting in a warmth and presence worthy of all performance environments. Inclusion of two necks (curved and straight) gives the player flexibility in optimizing ergonomic comfort when playing, while the sleek/lightweight Session Series case makes for easy transport. Standard High F# AND High G keys further facilitate execution within demands of modern performance. With the addition of the JSS1100 to the popular 1100 Series of Performance Level saxophones, Jupiter continues to redefine expectations for school and personal use, bringing advanced tools to advancing players.